Terian Williams‍ is still in the early stages of his recruitment, but schools are already serious about him and the 2022 Georgia athlete is serious about the process. 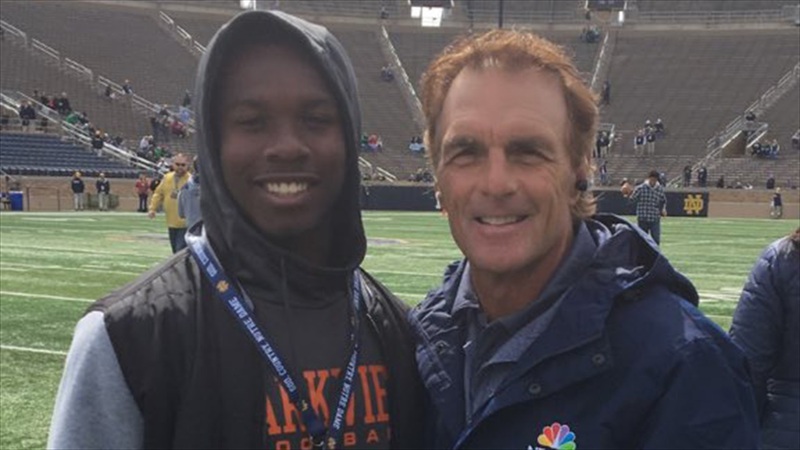 That’s why Williams was in South Bend on Saturday to watch Notre Dame’s spring game. He was impressed with what he saw. He also enjoyed taking in the annual Blue-Gold Game. “The game was good,” Williams said. “I like how they played it with offense and defense. I thought it was real up-tempo. I liked the no-huddle they were running. Williams plays quarterback and defensive back and doesn’t have a preference. “I can play both, wherever I’m needed on the field,” he said. He has early offers from Tennessee, Kentucky and Howard. He spoke with multiple Notre Dame coaches during the visit. Williams thought the Irish staff came off well. The youngster said he “most definitely” will be coming back for a camp. It is early, but Williams already has an idea of what will be most important when he’s making his decision in the end.